Is your organization losing money because of low employee engagement? Only 30% of the U.S. workforce was highly engaged according to a 2013 Gallup survey. This disengagement is costing organizations an estimated $450 to $55o billion each year. Find out the 14 key strategies you should be using to improve engagement, retention, trust and profitability. The Return On Investment for having a highly engaged workforce is HUGE. To succeed in a competitive industry, organizations cannot afford to dismiss the impact employee engagement has on the bottom line. - What is employee engagement? - Is it worth my organization investing in? - How do I engage employees? - Various outcome metrics of engaged employees. - How this relates to the multi-generational workforce. - 14 key strategies every organization should know about. - Suggestions for where to start building a strong engagement program. 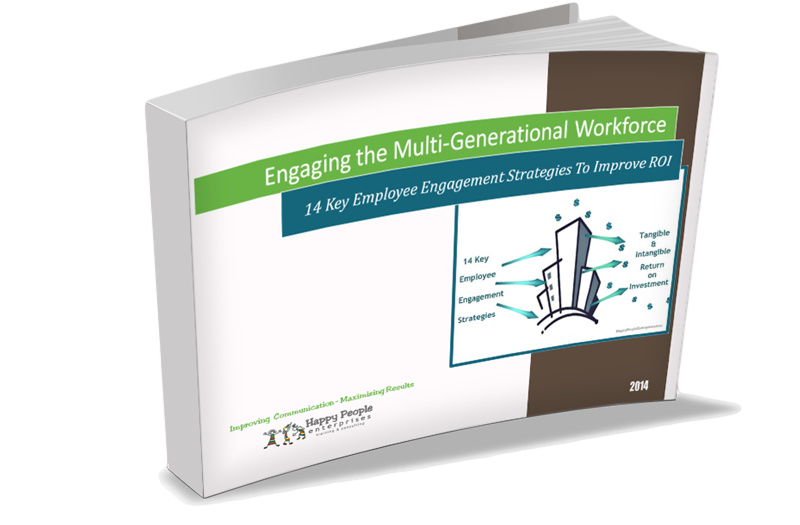 Get instant access to the Engaging the Multi-Generational Workforce paper NOW! By submitting your contact information, you will receive updates and articles from time to time. But, don't worry. We hate spam too, and will never give out your information. What is your biggest work-related challenge? How Critical is this Challenge?